I have access to a lot of new cookbooks as part of my job. It’s a pretty fantastic perk, really, but the growing stack on top of my fridge is starting to stress me out a little. There’s so much good stuff in there just going to waste. So, in the flush of excitement at the beginning of a new year and my desire to be better about producing new content here, I’ve decided on a new project for 2013: every week, I’ll cook something I haven’t made before and write about it. I cook a lot and generally like what I make, but I return to the same well more often than I’d like and I want to stretch myself a bit. It can be a recipe I haven’t made before, utilize an ingredient I haven’t worked with before, a new-to-me technique, a piece of equipment I haven’t played with. I’ve started putting together a preliminary list of ingredients and techniques I’d likely to knock off my list of never-dones and I’m pretty excited. Some of the recipes in consideration are things that I can see becoming regulars in the easy-dinner rotation, some are serious projects I’ll have to tackle over a couple of days, a couple of things I’ve never tasted and am curious to try. I’m calling the series My New 52. 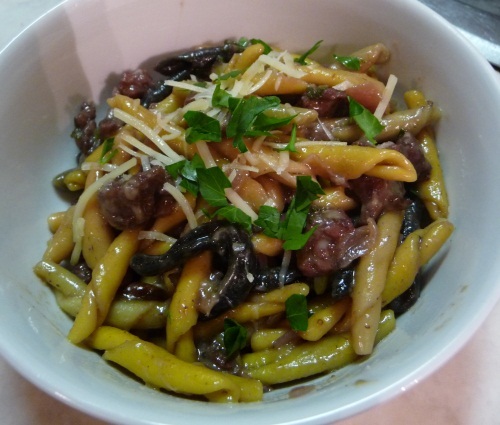 The first one up is a recipe I printed from Serious Eats and have had in my recipe binder for since October 2010: Andrew Carmellini’s Strozzapreti with Sausage, Grapes, and Red Wine. Andrew Carmellini is behind two of my favorite restaurants in New York, Locanda Verde and The Dutch, and I was interested to see how his recipes worked at home. There were a couple of clues to the fact that this is a chef’s recipe and not one from the kind of knowledgeable home cooks I usually draw from: he doesn’t have you drain off any of the sausage grease and you add two tablespoons of butter at the end. I have no doubt that both of those things contributed to the dish being delicious, despite a couple of things in my version being different from his. First, I don’t think I reduced the wine mixture enough, so when I added it to the sausage mixture, the meat turned magenta. Also, my grapes broke down somewhere in the cooking process and disappeared into the sauce. It tasted great, but I was looking forward to those little pops of tart sweetness. I used some naturally colored fancy pasta I had around, which is why there are dark pieces in there that look like green beans or mushrooms. So. Would I make it again? Maybe. It was definitely tasty; Rob and I both had two big bowls and I’m looking forward to the leftovers. It was a little more work than I’m generally interested in for an everyday meal at home though and I don’t necessarily want to serve purple meat to company. You have to start marinating the grapes at least eight hours before you start cooking, and the cooking process takes three different pots and pans, though it does come together pretty quickly once you get started. And a modified version wouldn’t be especially different from pasta dishes I make already, so it’s unlikely I’ll be reaching for this one again in a hurry. I’m keeping it in the recipe binder though. Just in case. Cut the grapes in half lengthwise. Combine the grapes, wine, sugar, and vinegar and put in a covered container in the fridge overnight (at least 8 hours). In a medium saucepot, bring the grape mixture to a boil over high heat. Cook at a boil until the liquid has reduced by half, about 10 minutes, then remove from heat. Cut the sausage casings open and remove the meat. Discard casings. Put a large pot of water on to boil for the pasta. Heat olive oil in a large pot over medium heat until shimmering. Add the meat and brown, stirring and breaking up the meat as you go, about 5 minutes. When the meat has begun to brown, add the onion and continue cooking, stirring well, until sausage is well browned and onions have softened, 5 to 7 minutes. Add the sage leaves and stir to combine. Add the grape mixture and stir well. When the water comes to a boil, cook the pasta until just al dente (subtract one minute from the directions on the package). Drain but do not rinse, reserving a few tablespoons of pasta water. Add the pasta to the sausage mixture and stir for 1 minute, adding a tablespoon of pasta water at a time to just moisten. Turn the heat off, add butter, cheese, and black pepper, stirring well. Add the parsley and serve immediately, topped with additional cheese. Great project idea, especially with so many books to choose from! The pasta sounds delish, and let’s face it, sausage is never going to be a health food choice. Call it comfort food and enjoy. Once in a while is good, every day not so much. THERE IS NOTHING WRONG WITH PURPLE MEAT. I mean…I’d eat it.